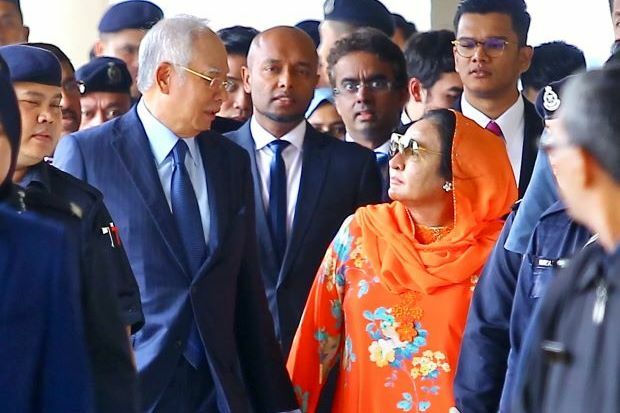 PUTRAJAYA: In an unprecedented turn of events, former prime minister Datuk Seri Najib Tun Razak and his wife Datin Seri Rosmah Mansor will both be in court today. After spending a night in the MACC lockup, investigators are bringing Rosmah to the Sessions Court in Kuala Lumpur to face a slew of money laundering charges while the case management for one of Najib’s cases will take place at the same time. Najib is facing some 32 charges including criminal breach of trust, abuse of power and money laundering of funds linked to 1Malaysia Development Bhd and its offshoot, SRC International Sdn Bhd. So far, Najib has been brought to court three times to face charges since July 4. As for Rosmah, today will be the first time she will be formally charged in relation to money laundering activities. It is believed that Rosmah could be slapped with up to 20 charges. Rosmah, 67, will go down in Malaysian history as the first wife of a prime minister to be indicted. The arrest came after she was questioned for more than four hours yesterday morning at the Malaysian Anti-Corruption Commission (MACC) headquarters here. The Star, followed by other media, broke the news of her arrest after the lunch break yesterday. At 3.20pm, MACC confirmed her arrest. The MACC made the arrest after being given the go-ahead by the Attorney General’s Chambers. The commission also said that Rosmah would be charged under Anti-Money Laundering, Anti-Terrorism Financing and Proceeds of Unlawful Activities Act. However, Rosmah’s lawyers said they were unaware of the charges that would be brought on their client. “We were only informed by the MACC of her arrest and that she would be brought to the Kuala Lumpur Sessions Court to be charged tomorrow. “They did not tell us the nature of the charges,” said Datuk Geethan Ram Vincent. The media who were stationed outside the MACC building from 9am waited for Rosmah who was called in for questioning for the third time since June 5. The investigations are related to the trail of funds from 1MDB and SRC International. She arrived at the MACC headquarters at 10.42am, dressed in a light green baju kurung and a matching selendang. As she walked past the crowd of reporters, she appeared calm and even stopped to shake hands. Sources said that Najib was informed of his wife’s arrest. “He appeared calm,” said a source when asked on Najib’s reaction to the news of Rosmah’s arrest. 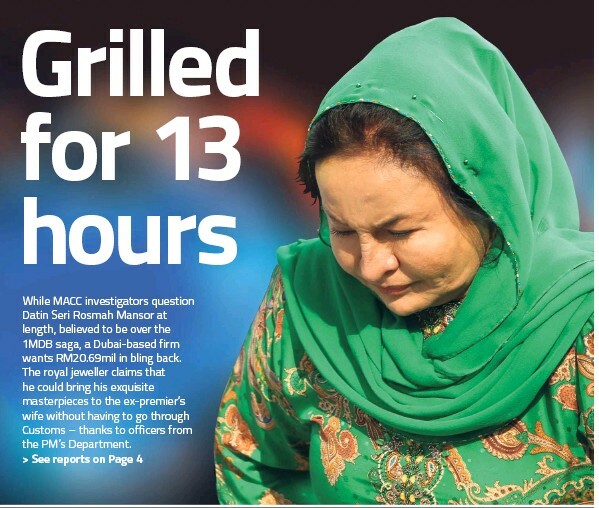 Rosmah was first called to the MACC on June 5 to answer questions on SRC International Sdn Bhd. On Sept 26 and yesterday, she was interrogated over the 1MDB scandal and money laundering. The first inkling of Rosmah being charged was on Sept 24 after MACC chief commissioner Datuk Seri Shukri Abdull was quoted as saying that the investigations on her had been completed and the report had been submitted to the Attorney General. He said then that it was up to the AG to prosecute Rosmah. Yesterday, Najib was also detained for questioning on matters related to 1MDB but in another location and by a different law enforcement agency. While Rosmah was in MACC, Najib was giving his statement at the Anti-Money Laundering and Anti-Terrorism Financing Prevention Unit (Amla) headquarters at Menara KPJ in Jalan Tun Razak. Pemantau Malaysia Baru president Datuk Lokman Noor Adam, who is also an Umno supreme council member, announced the day before on Facebook that Najib would be called in by the police at 10am yesterday. Najib was taken into the building through a side entrance after he arrived at Menara KPJ at about 11am, giving the media the slip. He managed to evade the press when he left the building from the elevated car park at 1.05pm, nearly three hours after he came to the Amla headquarters. Yesterday morning, a white luxury MPV was seen leaving the couple’s house in Jalan Langgak Duta earlier in the morning. However, it was not known whether it was transporting the couple or either one of them. Prior to his questioning at Menara KPJ yesterday, Najib, who is Pekan Member of Parliament, was called up on Aug 27 and 30 and then on Sept 30 to have his statement recorded on the case. In both instances, it was with the MACC. Exactly a week ago on Sept 26, Rosmah was called in for a second round of questioning – this time on 1MDB – which lasted 13 hours, also at the MACC. (AMLATFPUAA) 2001 at the Kuala Lumpur Sessions Court. 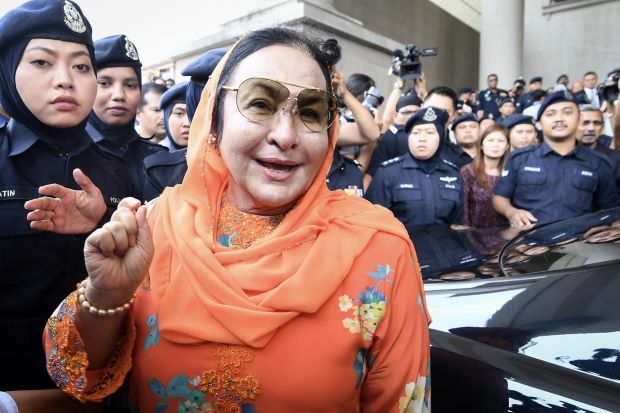 KUALA LUMPUR – Datin Seri Rosmah Mansor, wife of former Prime Minister Datuk Seri Najib Razak was slapped with 17 charges on money-laundering involving a total of RM7 million.